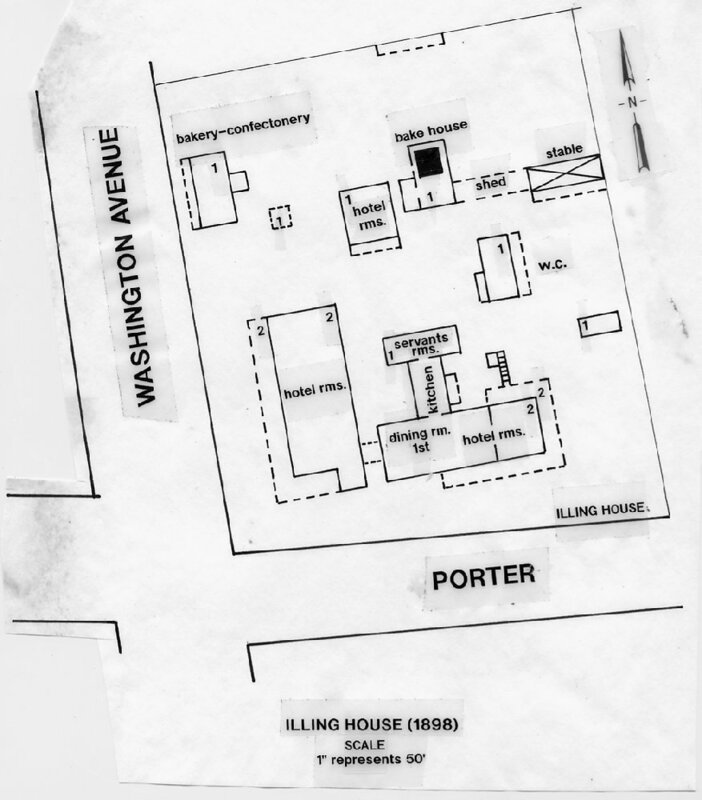 The Illing House was located on the northeast corner of Washington Avenue and Porter Avenue in Block 2, Lot 21 of the Culmseig Map (1854) of Ocean Springs. The Illing House was a large, L-shaped, hotel complex consisting of two main buildings which were wood framed and two stories tall. Large expansive galleries accommodated guests on both floors. There was approximately 7700 square feet of room space and 3668 square feet of gallery area. Additional buildings on the one acre property consisted of a baking house, bakery and confectionery shop, lodge, outhouse, stable, and WC (water closet?). The Illing House was built by Ferdinand William Illing (1838-1884), a native of Regansburg, Bavaria, Germany. Young Illing studied botany in Europe and in 1864 came to North America to design and develop the Palace Gardens of Maximilian, the Arch Duke of Austria and Emperor of Mexico, at Mexico City. After Maximilian was overthrown in 1866, Illing sailed to New Orleans and settled at Ocean Springs. He purchased land on the northeast corner of Washington and Porter Avenues at Ocean Springs where he planted pecan trees and practiced horticulture. In 1869, at Ocean Springs, Ferdinand Illing married Rosalie Eglin (1844-1894), a native of Alsace in France. This marriage produced four children: Eugene William Illing (1870-1947), Alice Elizabeth Illing (1874-1876), Edward Ferdinand Illing (1878-1952), and Camilla Louise Illing Kiernan (1882-1960). Illing's House located in "the heart" of the village on the principal thoroughfare, is a favorite resort, and no wonder, for Mr. Illing is one of the most popular of landlords and he is ably assisted by an energetic and accommodating wife, and they manage to make a guest feel perfectly "at home". Apartments for families and single persons. Boarding by the day, week, or month. Apartments for rent for families and single persons. The Illing House was noted for its excellent table. With his horticulturist training, Illing maintained a large garden at the rear of the hotel where he raised vegetables and fruit. Mrs. Illing was continually asked for her fig and fruit preserve recipes which she prepared for their guests. The Illings also maintained dairy cows for fresh milk. One of the oldest and best located hostelries in Ocean Springs. Delightful verandas harbored from the rays of the sun by giant rose bushes and other sweet scented flowers. Winter and summer visitors entertained in a homelike way. All conveniences for fishing, boating, and bathing. The Illing House, one of the oldest landmarks of our town is being rapidly demolished to be converted into small cottages with all modern conveniences. Judge Illing is to be complemented on his enterprise. The History of Jackson County, Mississippi, "Ferdinand W. Illing", (Jackson County Genealogical Society: Pascagoula-1989), pp. 242-243. Box Office, “33 Years an Exhibitor ‘Judge’ Illing Is Dead”, July 26, 1947. Men and Matters, Volume 4, No. 11, October 1898, pp. 75-76. The Biloxi Herald, “Ocean Springs”, November 28, 1891. The Ocean Springs Record, "First Baptist of OS/ The Birth of a Church", September 9, 1982. The Ocean Wave, "Illing House", December 5, 1896. The Pascagoula Democrat-Star, "Ocean Springs News", June 6, 1879, p. 3. The Pascagoula Democrat-Star, August 22, 1879, p. 3. The Pascagoula Democrat-Star, “Ocean Springs Items”, May 14, 1880. The Pascagoula Democrat-Star, “Ocean Springs Items”, June 11, 1880. The Pascagoula Democrat-Star, “Ocean Springs Items”, July 16, 1880. The Pascagoula Democrat-Star, “Ocean Springs Items”, May 1, 1891. The Pascagoula Democrat-Star, December 1, 1893. The Star of Pascagoula, "Our Sea Coast", June 6, 1874, p. 2. The Times Picayune, “Printing Firm’s President Dies”, 1952. Sanborn Map Company (New York City), "Ocean Springs, Ms.", (1898)-Sheet 2. Sanborn Map Company (New York City), "Ocean Springs, Ms.", (1909)-Sheet 1. Sanborn Map Company (New York City), "Ocean Springs, Ms.", (1915)-Sheet 1. Sanborn Map Company (New York City), "Ocean Springs, Ms.", (1925)-Sheet 4. Marion Illing Moran - October 12, 1990. J.K. Lemon - February 17, 1994.